I always want to make healthy and delicious food for my friends and family. Recently I had to make some special food which is suitable for diabetes patient. My father was a diabetes patient. So my mother always had to conscious about his food. Now many of my friends are suffering from diabetes in their early age. So all of us have to conscious about their food and nutrition. 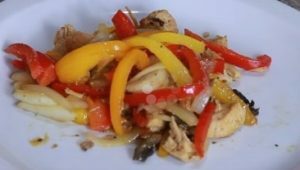 Chicken with bell peppers recipe is a suitable food for diabetes patients. Today I want to dedicate this diabetic recipe for my diabetes friends. Last week I prepared this recipe for a diabetes patient and she appreciated it very much. That made me very happy. 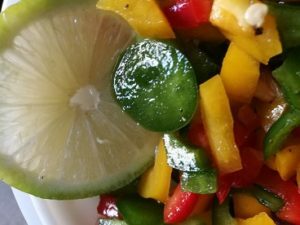 Here are two recipes of chicken with bell peppers and one bell peppers salad recipes are included. One baked in the oven and the other cooked in the normal burner. Both the recipes are good for diabetic and heart patient due to low calorie and low fat. These are very easy to prepare as well. 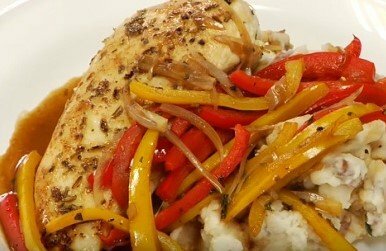 Baked chicken with bell peppers recipe is a healthy recipe. Chicken is always suggested as low fat meat. It is also commonly available meat in the market at affordable price. Taste of chicken is also liked by everyone. So you can prepare different dishes with chicken at any time. We know the baked food is always good for health. Remove the fat from chicken pieces and split into 4 medium pieces with a sharp knife. I always use Cuisinart knife for cutting. This knife is very comfortable to use. Wash and rinse it very well. Marinate chicken breast with garlic paste, ginger paste, cumin powder, coriander powder, turmeric powder, chili powder, lemon juice, yogurt, and salt and keep in the refrigerator for 2-3 hours. Apply oil in a wok and fry bell pepper. Here I used the T-fal wok. (I used this company frying pan for many years). 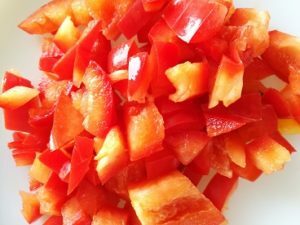 Fry the sliced bell pepper. After 1-2 minutes add the marinated chicken breasts. Turn over the chicken to fry on both sides with the bell pepper. Greased the baking tray with oil. After about 2 minutes shift the chicken pieces to a greased baking tray. Bake at 350⁰F for 40-45 minutes, or until properly baked. Baking time is always depended on an oven to oven. I used Miyako electric oven. For my oven this time and temperature are perfect. Baked chicken is ready to serve. Transfer the chicken and bell pepper in a serving dish. Serve the bell paper baked chicken with paratha, naan, or tortilla and sauce. Remove the fat from chicken pieces. Cut the chicken breast into thin strips with a sharp knife. Cut onion and bell pepper into long strips. Heat 1 tbsp oil in a wok over high heat. Add chicken and stir. Cook for 1 minute. Then add ginger, garlic, salt, and sesame seeds to the chicken. Add soya sauce then cook for 1 minute. Here I used Heinz soya sauce. Personally, I liked this brand’s sauce. You can use any branded sauce as for per your choice. Keep it aside. Heat oil in another non-stick frying pan over medium heat. Add onion to the oil and stir it. After 1 minute add sliced bell pepper and stir until tender. Add cooked chicken slices and cook all together for 30 seconds. Chicken with bell pepper is ready to serve. Transfer the chicken and bell pepper to a serving dish. Serve the chicken with tortilla or rice or bread. This colorful chicken salad is very simple and tasty. It is a very good choice with chicken with bell peppers. Take bone less chicken and remove fat. Cut the chicken pieces with a sharp knife into thin and long slices. Stir fry all chicken pieces with a little bit of salt. 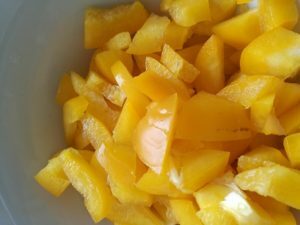 Cut the bell peppers into thin slices. Mix lemon juice, honey, salt, pepper, and olive oil in a small bowl. Whisk and make the salad dressing. Add chicken pieces, bell pepper slices to the salad dressing. Chicken with bell peppers salad is ready to serve. Serve the salad “the chicken with bell peppers”. I love to cook and like to share my delicious food recipes with my beloved friends. 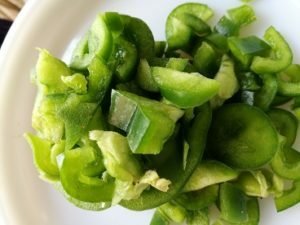 If you like my chicken with bell peppers recipe please share the recipe with your family and friends.